If you love fish patties, here's another one to satisfy your taste buds. These deep-fried fish cakes are perfect for both as a tea time snack and as a serving in a cocktail party. Feel free to pair it with your favorite dip or sauce. The quantity of Thai red curry paste used in this recipe can be moderated as per your taste. You can prepare and refrigerate the seasoned fish mixture in advance and can quickly deep fry the patties as and when required. When served piping hot, these fish cakes smell divine making you crave for more and more. For best results, heat the oil up to a high temperature and switch back to a medium flame when frying the patties. 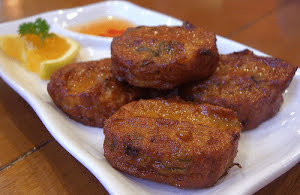 Let's make these scrumptious Thai fish cakes for our loved ones. Savor these flavorful, fulfilling, and spicy Thai fish cakes consisting of red curry paste which gives it a unique and fiery flavor you won’t be able to resist. Wrap the fish meat in an aluminum foil (keep 3/4 part open) and microwave it for 2 minutes on a high setting. Unwrap the foil and pat dry all the semi-cooked fish pieces with a paper towel. Add Thai red curry paste, whipped eggs, cornflour, garlic paste, and salt to the blender. Pulse until everything is combined well and you get a nice and smooth patty paste base. Transfer the flavorful fish paste to a large bowl. Add minced long beans and minced kaffir lime leaves to the bowl. Combine everything well with a large spatula or with your hands. Wet your hands with water or vegetable oil. Make even-sized patties from the fish paste. Heat oil in a large pot on a medium flame. In batches, deep fry all the fish cakes till they turn golden brown. Transfer the fried patties to a paper towel to remove excess oil. Serve hot with your preferred dip or sauce.